Some people think that to be strong is to never feel pain. In reality, the trongest people are the ones who feel it, understand it, and accept it. Quote : Some people think that to be strong is to never feel pain. 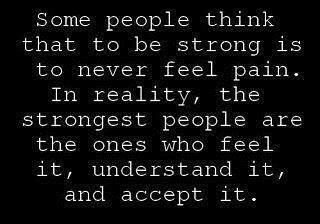 In reality, the trongest people are the ones who feel it, understand it, and accept it.